Last March, CenturyLink cut the ribbon on its new Technology Center of Excellence in Monroe, Louisiana. The 300,000 square-foot R&D center features NanoWrap visualization solutions from NanoLumens. The new building’s lobby is a "palace of glass" that incorporates 37,000 square feet of View Dynamic Glass. It is the single largest installation of electrochromic glass in the country. View Dynamic Glass uses nanotechnology and pre-programmed intelligence to tint automatically in response to outside conditions and user preferences, eliminating the need for blinds or shades. Even with that technology, the lobby is still very bright. The brightness of NanoLumens’ technology, which can be adjusted as the ambient light levels change throughout the day work to ensure that the video on the solutions will remain clear and visible under any conditions. 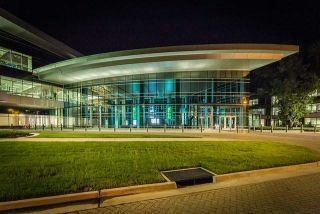 The center also includes a technology research and development lab, a network operations center, a customer experience center and a collaborative office and meeting space. NanoLumens NanoWrap solutions helped the client make this visual statement and capture the attention of customers as they walk through the door, said Cating. Three columns in the building’s three-story-tall atrium are wrapped with NanoLumens’ 5MM NanoWrap displays in a 42-inch-diameter circular panel that covers 12 feet of vertical surface on each column. The NanoLumens LED panels, made up of thousands of Nixel, NanoLumens’ patented display module, turn these architectural elements into archi-technological elements. They provide a continuous stream of full-motion video that’s visible throughout the entire lobby and from any angle. Each display can show different video content or all three columns can play synchronously, with content fed over IPTV via fiber from a cloud-based Cisco-AppSpace content delivery system.